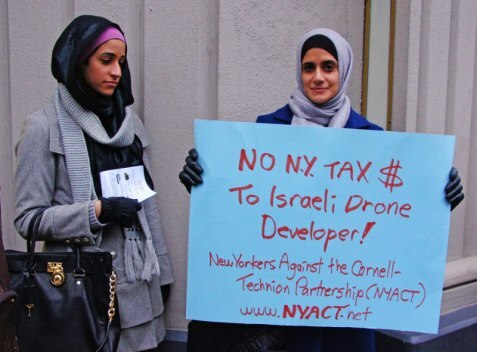 Press release from our member group New Yorkers Against the Cornell-Technion Partnership. See pictures of the protest here. Their next planned action is on Tuesday, January 29 from 5:00pm-7:00pm. Find details here. Protesters outnumbered students on a blustery Martin Luther King Day as the New York Cornell-Technion Partnership held its first day of classes at Google’s Chelsea offices in Manhattan. Cornell University always holds classes on this holiday, and the annual insult to Dr. King’s memory is sadly fitting with the support for racism the school is showing by pairing with The Technion – Israel Institute of Technology, Israel’s foremost research and develop institution for weapons (including drones), surveillance systems, and other instruments of death and destruction used to maintain an apartheid system against Palestinians and for use in wars against Israel’s Arab neighbors. The 25 New Yorkers leafleting against the Cornell-Technion Partnership (contrasting the eight students inside, according to the New York Times), denounced Google’s gift of free office space to the Partnership, as well as the $100 million in funds and $300 million in real estate given by the City of New York to the questionably fast-tracked venture. Protesters also gathered signatures on a petition demanding an end to private and public support for the Partnership (online at: http://www.gopetition.com/petitions/no-to-technion-in-nyc.html). The campaign against the Cornell-Technion Partnership is part of a global effort in support of the Palestinian call for Boycott, Divestment, and Sanctions (BDS) against institutions doing business with apartheid Israel. Regular classes will be held at the Google offices until the main campus opens on Roosevelt Island in 2017. Among those handing out flyers and talking to workers and students from the Google building as well as Chelsea residents were several Cornell University students outraged at the Partnership’s violation of Cornell’s own rules for consulting staff and faculty over such business deals. NYACT has also denounced the callous disregard for the health, safety and housing needs of Roosevelt Island residents. As construction begins for the eventual permanent Partnership site on the Island, homes are being torn down, and patients are being kicked out of the City hospital system’s Coler-Goldwater long-term care facilities. New Yorkers with serious disabilities and life-threatening medical conditions are being displaced by the City in deference to the Partnership. NYACT has attended several Roosevelt Island community meetings to forge an alliance with residents, patients and healthcare workers whose lives are being disrupted or even jeopardized by Cornell and Technion.